Big Band Library: Tony Pastor: "When I'm Calling You"
When Shaw organized a band in 1936, he hired Pastor. Most notably during the next three years, Pastor played the sax solo on, among others, Shaw's Begin the Beguine and sang the vocals on such arrangements as Indian Love Call and Rosalie. Pastor won the 1940 Metronome magazine poll as top tenor saxophonist. That same year, he formed his own orchestra, which began working various spots, including the State Ballroom in Bridgeport, CT; Barney Rapp's in Cincinnati, OH; at Virginia Beach, VA; and the Casa Manana in Hollywood. Hired at the Hotel Lincoln in New York City for two weeks, they wound up staying for seven months. Later, there were performances at Camp Croft in Spartensburg, NC and the Palladium in Hollywood, and then a return to New York City for bookings at the Hotel New Yorker and the 400 Restaurant. It was estimated that between 1940 and 1950 Pastor's band traveled a million miles around the U.S.
death Oct. 31, 1969, New London, CT, "a heart ailment"
brother Salvatore (nicknamed "Stubby"), b.Apr. 8, 1893?, d.Oct. 1976? brother James F., b.Feb. 5, 1914?, d.Dec. 14, 2008? sister Mrs. Josephine Saraceno, b.Sept. 15, 1895?, d.May 1970? Pastor was able to continue a successful musical career into the mid-1960s. Song), each of which he sang. Besides his brother, "Stubby," who played one of the trumpets in the group for over 10 years starting in 1941, members of Pastor's orchestra included, at various times, Charlie Trotta on trumpet; Moe Zudikoff [ aka "Buddy Morrow" ] and Lou McGarity, trombones; Bill Shine or Johnny McAfee, alto saxophones; and Dave Pell, tenor saxophone. Les Burness served as Pastor's pianist from 1940 on, remaining for more than 25 years. When vocalist Virginia Maxey left in 1946, Pastor heard two young sisters singing in Cincinnati and hired them; Rosemary Clooney, 17, and her sister, Betty, 15, became a popular attraction with him. 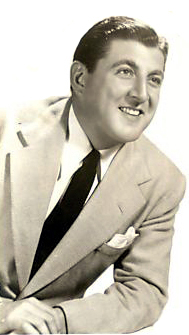 Pastor and his orchestra appeared on television a number of times during the 1950s, including the "Cavalcade of Bands" program and the Robert Q. Lewis show. In 1960, Pastor was guest of honor on a "This Is Your Life" TV episode. But eventually he reduced the size of his band, cutting it down to a small combo in order to work nightclubs around Las Vegas with his sons Guy and Tony Jr.
Pastor's final recordings were for Roulette (1958), Everest (1959), and Capitol (1960). He appeared with a small group, billed as "Tony Pastor and His All-Stars," on the "Bring Back the Bands" transcribed radio show in 1967. Early in 1968, Pastor suffered a heart attack and was ill for a year and a half before he died. "Tony Pastor Dies; Big Name in Bands," Hartford Courant, Nov. 1, 1969, p.4. S.S.S., "Tony Pastor: Tune Stylist," International Musician, Jul. 1950, p.15. There was a full-bodied, warm tone from his tenor saxophone and joy in his high-pitched, exuberant singing voice, which he freely admitted was patterned after his idol, Louis Armstrong. "Mr. Pastor was a short, stocky man whose dark hair curved into a deep widow's peak, framing a face that seemed irrepressibly jovial," a reporter once observed. He first got hold of a saxophone at the age of 16 and, after a few years, joined a succession of bands including John Cavallaro (where he met an admiring Artie Shaw), Irving Aaronson and His Commanders, and Austin Wylie.